Ukiki Jammin' is the second level of World 3 found in Yoshi's New Island. 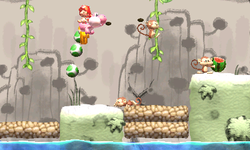 Pink Yoshi starts the level in a jungle-like area with some Ukikis and some muddy hills, with a pink door leading to an area with a switch. It activates red platforms which must be traversed in a short time in order to get a Smiley Flower. The nearby blue door leads to a Checkpoint Ring, along with some more Ukikis. Eventually, the player reaches the Goal Ring. The background in this level is based off of a Japanese oil painting.